It was 50 years ago that Loretta Lynn sang her way into America's heart with 'Honky Tonk Girl,' the first single by the soon-to-be country star. The now country music icon kicks off that 50th anniversary in a big way this weekend, when she receives a special GRAMMY Lifetime Achievement Award in an invitation-only ceremony in Los Angeles. Held this Saturday -- the eve of the GRAMMY awards, the honor is given to performers who, during their lifetimes, have made creative contributions of outstanding artistic significance to the field of recording. Other luminaries who have been awarded this honor include Roy Acuff, Louis Armstrong, Joan Baez, Johnny Cash, Barbra Streisand, Perry Como, Bob Dylan and Frank Sinatra. The Lifetime Achievement Award is just the beginning of a year of celebration for Loretta. There are plans to release an all-star tribute album this fall. While participating artists have not been announced, they are expected to come from all genres of music to honor and celebrate the career of the woman known as The Coalminer's Daughter. Later this year, Lynn's bestselling autobiography, 'Coal Miner's Daughter,' first published in 1976, will be reissued, as will the film by the same name starring SIssy Spacek as Loretta and Tommy Lee Jones as her husband, Mooney. Beverly D'Angelo portrays Loretta's friend, Patsy Cline, and Levon Helm has the part of her father, Ted Webb. Ernest Tubb makes an appearance as himself. 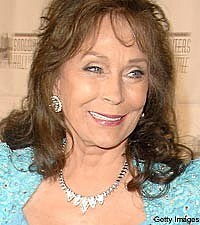 Loretta has had an award-winning career, including three GRAMMY awards, 16 No. 1 songs including 'One's On The Way,' 'Don't Come Home a'Drinkin' (with Lovin' on Your Mind)' and 'You Ain't Woman Enough (To Take My Man),' and inclusion in the Country Music Hall of Fame.